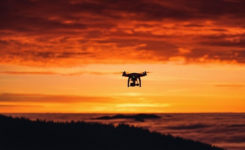 Future UAVs will require relative navigation capability to fulfill a broad range of assisted manned and unmanned missions. A new approach, demonstrated in application to aerial refueling, provides access to accurate relative time-space positioning information (R-TSPI) between platforms. all of which require access to accurate relative time-space positioning information (R-TSPI) between platforms. In this article, we present the foundation for a generic approach to relative navigation capable of meeting the full range of relative assisted manned and unmanned operations. We present a relative extended Kalman filter (R-EKF) that integrates line-of-sight relative observations from GPS as well as non GPS-based onboard sensors measuring relative bearing and/or relative distance. Multi-sensor fusion provides enhanced system integrity and robustness to partial or total lack of GPS-satellite navigation (GPS-denied). The relative navigation system described here uses these technologies, providing up to 100 Hz R-TSPI with an accuracy of up to ±1.0 m (a function of relative distance), ±0.1 m/s velocity and ±0.5º attitude. The system can be applied to a variety of relative navigation applications; here we focus on its use in aerial refueling. provide data to drogue-control engineers to improve control law design. 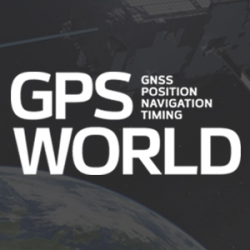 As a GPS/INS system, Geo-RelNAV can produce a relative navigation solution at a faster sample rate than GPS alone. Solutions are available via serial and/or Ethernet (both TCP and UDP) providing input to external systems as well as the tools for analysis engineers to monitor the data in real time using standard monitoring and recording tools. The system provides R-TSPI in different frames, including the body frame of the platforms, local navigation frame (wander-azimuth) and Earth-fixed frame, as well as transferring the solution to arbitrary points of interest on the aircraft such as the refueling aircraft’s refueling probe. We use the terms primary and secondary in this article to identify the platforms for which R-TSPI data is being generated. R-TSPI is always provided for the primary with respect to the secondary. Referring to Figure 1, the tanker is considered the primary and the refueling aircraft, the secondary (or vice versa, depending on the location of the control segment). Data is always transmitted through the data link from the secondary to the primary. Figure 1 summarizes the geometric relations, where the primary body frame is labeled p-frame and the secondary body frame is labeled s-frame. The body frame fixed to the primary (P) is shown by (xPp,yPp,zPp), and body frame fixed to the secondary (S) is shown by (xSs,ySs,zSs ). Fgure 1. Primary/secondary geometry and corresponding body frames fixed to the vehicle body. where qp and qs are the quaternion attitudes of the primary and secondary with respect to the i-frame, qp* is the conjugate of qp, and is the quaternion multiplication operator. Hardware for the relative navigation system. The (ΔxpPS )GPS term is the relative position measured by using GPS data, and the term (ΔxpPS)INS is the relative position, which is predicted by using the last updated inertial solutions. Note that in order to use this relative observation, the lever-arm vector between the GPS and IMU of both the primary and the secondary must be accurately measured and applied (see Figure 2). Figure 2. Relative observation model. Equations (3) and (7) are the fundamental equations of the R-EKF. Relative navigation is computed and provided at one of the units, designated the primary unit. This requires data from the secondary unit to be transferred to the primary unit over a data link. The primary unit uses this transmitted data to calculate its position, velocity and attitude relative to the secondary unit. Figure 3 summarizes the architecture and data-flow. Mathematically, the data from the secondary unit used in the relative calculations are assumed to be errorless. We distinguish the following three relative navigation stages, illustrated in Figure 4, where each phase utilizes a unique processing mode. Fgure 4. Relative navigation phases. In the Approach phase, the data link between primary and secondary units is not closed. An autonomous navigation solution for both the primary and secondary units is computed on each platform independently. This information will be later used when the system transitions to the Engagement phase to initialize the R-EKF. In the Engagement phase, the data link between primary and secondary units is closed, and the R-TSPI solution is computed between the platforms. Sensor observations are transmitted across the data link from the secondary unit to the primary unit. The primary unit implements the R‑EKF to produce the R-TSPI solution. In the Departure phase, the activity requiring R-TSPI (that is, refueling) is complete, and the secondary platform pulls away from the primary platform. In this phase, we transition from the R-EKF back to the autonomous independent navigation system. The Approach phase is as important as the Engagement phase in attenuating the initialization error in terms of position, velocity and attitude. To initialize the R-EKF, the autonomous TSPI solution from the secondary unit is transferred to the primary unit, where the initial relative position, velocity and attitude are estimated. when there is a large latency in the data link. If the data link latency is too large, the data arriving at the primary can no longer be used. Several system tests were conducted including static bench testing, dynamic ground vehicle testing and flight testing. We discuss the results for the static and bench testing here. For static bench testing, the system was set up on two points with a measured fixed displacement. The sensor configuration included dual-frequency GPS receivers, ring laser gyro-based IMUs, and a data link operating in the 900-MHz frequency band. The results show that relative position held to the fixed offset with a standard deviation of less than 0.1 m in North, East and Up. Relative velocity held to zero with a standard deviation less than 0.01 m/s, and relative attitude was also maintained with the accuracy up to the gyro bias stability of the ring laser gyro IMU (1°/hr for a stationary platform). The overall performance of the system in static bench test confirms the stability of the hardware and software of the system, when it is not exposed to any dynamics, and the sensors are in close proximity (no data link latency or data dropouts). Dynamic Drive Test. In a more realistic test to simulate the operational phases described in Figure 4, the drive test followed a scripted path. As shown in Figure 5, the two platforms left Geodetics’ facility and drove separately (simulated Approach) until they met each other at the Fiesta Island test site, where the data link was closed for the Engagement phase. The primary and secondary navigation systems operated independently during the Approach phase. Figure 5. Drive test ground trajectory of the primary (blue) and secondary (red). Once the data link was closed at the test site, the R-EKF engaged, using initialization information transmitted from the secondary to the primary platform. To provide a “truth source” for evaluating the performance of the relative navigation solution, both autonomous GPS/IMU systems were fed data from an external reference receiver. Table 1 shows the statistical data analysis in the form of mean and standard deviation for the collected data. Average RMS of fit in the relative position, velocity and attitude of approximately 1.0 m, 0.1 m/s and 0.3º, respectively, were computed for the entire relative navigation period. In this dynamic test, we encountered frequent data link dropouts, data link latency, as well as GPS outages, causing discontinuity in the R-EKF measurement updates until GPS was reacquired. During these periods, the R-EKF prediction model, updated with the last calibrated IMU data, provided the R-TSPI. This test help confirm that system performance is at the expected levels, even in the presence of real-world data link and GPS problems. Table 1. Statistical analysis of the R-TSPI solution. Over-reliance on GPS has exposed vulnerabilities associated with this technology. For example, GPS is easily jammed and spoofed. While spoofing can be addressed with Selective Availability Anti-Spoofing (SAASM) technology, and advances such as M-code will mitigate other vulnerabilities, systems of the future must be robust to partial or total lack of GPS. Advanced sensor-fusion technologies are necessary to provide capabilities in conjunction with, and in the absence of, GPS. In the context of aerial refueling, sensors such as active and passive vision systems can be used as complimentary observations by the system, providing a GPS-free relative distance observation in situations where GPS is blocked due to airframe masking, jamming, and so on. 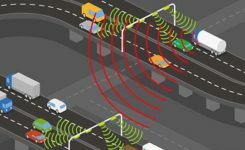 Data from both active (lidar) and passive (camera) vision sensors were added to the system, providing significant advantages in the process flow. The use of vision sensors provides the relative distance observation in GPS-denied conditions for continuity in R-EKF updating. In addition, vision-based relative distance allows for the detection of outliers by evaluating the redundancy contribution of the measured GPS-based relative distance, and enables the transfer of the R-TSPI solution from the secondary refueling center to the on-the-fly probe-drogue system, as shown in Figure 6. For the active vision system, we leveraged a fully integrated lidar mapping payload as shown in Figure 7 (left). For the passive sensor, we utilize a stereo camera. Figure 7 (right) shows the test area and the simulated drogue. Imagery observations from the passive camera and the lidar system were processed with independent algorithms appropriate to each data type and the relative distance between each of the two sensors, and the simulated drogue was measured with an RMS error of less than 10 cm. Figure 7. Geo-MMS (left) and its application (right) for measuring relative distance. While outside the scope of this article, in addition to supplying a GPS-free relative distance observation, the use of vision sensors was applied to the task of increasing system integrity. This includes, in general, the capability to indicate when the system should not be used for the intended operation. We focused on two aspects: outlier detection (inner reliability), and the effect of undetected outliers (outer reliability). To properly address the reliability and integrity requirements, a quality testing mechanism was designed to assess the estimated/predicted relative distance observations before passing them in to the R-EKF module. An autonomous relative navigation, in its application for the aerial refueling problem, places special attention on system architecture so that it can handle most possible real-world scenarios, including frequent data link dropouts, data link latency and GPS outages. The core of the system is a relative extended Kalman filter, which uses GPS and IMU measurements of the primary and secondary platforms to estimate the relative inertial navigation states. The system is able to provide relative TSPI at the IMU sample rate with an accuracy of ±1.0 m position, 0.1 m/s velocity and ±0.5º attitude. An added benefit of the system architecture is the ability to add observation models that do not rely on GPS. Thus, redundancy can be introduced using sensors such as vision systems. SHAHRAM MOAFIPOOR is a senior navigation scientist at Geodetics, focusing on new sensor technologies, sensor-fusion architectures, application software, embedded firmware and sensor interoperability in GPS and GPS-denied environments. He holds a Ph.D. in geodetic science from The Ohio State University. JEFFREY A. FAYMAN serves as Geodetics’ CTO. He holds a Ph.D. in computer science from the Technion Israel Institute of Technology and has published more than 40 papers in robotics, computer vision, computer graphics and navigation systems. LYDIA BOCK serves as Geodetics’ president and CEO. She has more than 35 years of industry experience spanning a variety of high-tech industries including electronics, semiconductors and telecommunications. She has a Ph.D. from the Massachusetts Institute of Technology. DAVID HONCIK, Geodetics’ director of engineering, has more than 30 years of experience in software/hardware integration and structured software design for real-time embedded systems, Windows programs, graphics, telecommunications, aerospace, flight simulation and airborne instrumentation. The integrated lidar mapping payload referenced is Geodetics’ Geo-MMS system.